Based on the official mileage tables, Newport is exactly 704 miles, and two-thirds the total distance is 705 miles, so, depending on exactly where they count as ‘Newport‘1, today, or even maybe yesterday I pass another milestone. I had originally thought of setting off early and walking to Strumble Head and then getting the Strumble Shuttle bus back to Newport. However, I had been warned the night before that Newport to Fishguard was sufficient for one day, so instead I had a more relaxed morning and long breakfast at the Morawelon Café beside the campsite. It is obviously catering slightly more upmarket with wicker chairs and breakfast at £8.75 (tea/coffee extra), as opposed to the Fronlas Café the day before at £6.75 (tea/coffee included). The path south of Newport is nothing like the Cardigan–Newport stretch. I think this is partly because it is close to multiple access points and therefore more heavily trodden. Also the fact that it is used more will undoubtedly lead to higher investment; certainly there are places where steps have been cut here that would have been left as a muddy slope on the more remote stretch. In one place, I note that the path below my feet has been cut flat from solid rock, not unlike the Roman Steps, except using more modern machinery. I recall the small bulldozer I was told about, but here there was obviously some heavy rock cutting also. In another place the cliff had eroded, leaving the path literally clinging to the remaining rock, but it was diverted. A few yards inland, a small section was taken and re-fenced from the farmer’s field. These are a reminder of both the initial cost and ongoing maintenance cost of the Path as a whole. In some places, especially around Dinas Head, the cliff is as precipitous as the day before; indeed I was told that Dinas Head has the highest cliffs on the Pembrokeshire Coast Path. However, here the path is trodden wider, and where the grass and bracken might have threatened, they have been strimmed back. I realise that the strimming may well be partly why the path is wider; if the grass is strimmed, walkers may walk on the short-cropped grass, wearing the path more evenly. Of course, on the Cardigan–Newport section, maintenance would involve at least a three-mile journey with a strimmer, and the more inaccessible parts may well breach health and safety rules. I wonder about letting a herd of feral goats loose on the cliff side of the field fences to keep the grass cropped, as it was in the pony section, but then imagine meeting a feral goat on one of the narrow path sections … well, may not be my best idea. 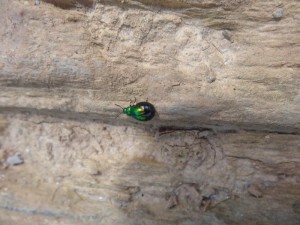 A green iridescent beetle basks on a stone, and a bit further on a large black beetle trundles across the dusty path. Its deep black shows up clearly against the fawn earth and I realise that it is in danger crossing this open ground, just like a soldier in Afghanistan crossing a sniper’s kill zone. In some ways the thick carapaced beetle is more like a tank, so maybe in the open it is more like the Libyan column, withdrawing from Benghazi in line with UN resolutions, then massacred from the skies, tanks torn apart like sardine cans in a rubbish tip. This brings to mind also the retreating column of Iraqi soldiers, fleeing Kuwait during the first Gulf War, tens of thousands shot in the back as they ran. It is no new thing to slaughter a defeated army; a dead enemy cannot fight again. It is the same perverted logic as Srebrenica. Maybe the medieval solution was more humane, simply cut off the bow finger. I am not regularly hearing or reading news while walking, but when I do, the events in Syria form a backdrop. The earlier war in Libya has exacerbated things there so much: first, for a crucial year, taking attention away from a real crushing of dissent; second, telling dictatorial powers that there is no room for compromise or diplomacy, and so giving hard-liners the upper hand; and finally, by twisting a resolution for humanitarian protection into a pretext for regime change, making future humanitarian resolutions far more difficult. Cwm-yr-Eglwys (valley of the church) nestles on the protected east side of Dinas Island. Of the church, there is but one end wall remaining, its empty doorway looking out to sea amongst the graves. This sounds vaguely Gothic, but in fact, on a sunny day, is more picturesque, and I take quite a few photographs. A man comes into the churchyard and approaches. "Do you want me to take one with you in? ", he asks, "Sue thought you might." 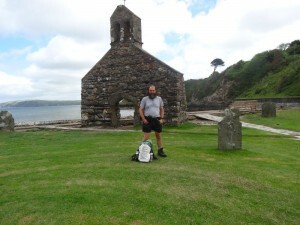 He takes a photo of me with my rucksack beside me and the church remains behind. His name is David, and he and his wife run a campsite, Greenore, at Tremain, near Aberporth. They invite me to stay there for free, but unfortunately I’ve already passed there a day or two previously. This is their first time at Cwm-yr-Eglwys. 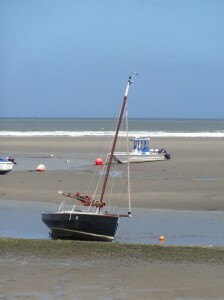 They sail and have spotted it from the sea and wanted to take a closer look. We talk about the coast. I realised yesterday that the coast there was only visible when walking or from the sea, no quick bus trip to a viewpoint. As I mentioned, I was told that Dinas Head is the highest point of the Pembrokeshire Coast Path, and from the map the trig point at the peak is at 142 metres (470 feet). The views there are spectacular, thirty miles of coast open out in either direction. The far side of Dinas Island is Pwllgwaelod, where there is a beach, a car park and a small restaurant, and I was told was a good place to stop for a beer. Behind Pwllgwaelod is a shallow-bottomed valley-like area with steep slopes towards land on the south and towards Dinas Island on the north. However, this is no simple stream making its escape: rather than rising up to the hills, at the other end of the ‘valley’ is Cwm-yr-Eglwys. Indeed whilst Dinas ‘Island’ is attached to the mainland, the connecting land is barely 5 metres above sea level. So maybe it once was an island and then the channel between it and the mainland gradually filled with the remains of crumbling cliffs or choked with tide-driven sand until it is the land we see today. From Dinas Head the coastline towards Fishguard looked like a discarded half-eaten sandwich, each cove a tooth mark. However, up close it is the rocks that are the teeth. The vertical strata are cut and cross-cut by fissures and fault lines, so that battered by wave and rain, they shard and stand from the sea like filed incisors or a scene from Jaws, dragon teeth gnashing rabid, but ineffectual, against wave and air. It is less well trodden than the stretch between Newport and Cwm-yr-Eglwys or around Dinas Island, and not without precipitous cliffs, but still nothing like the Cardigan–Newport stretch. The landscape is lovely, but I find it a little monotonous, into one cove, round it, round the next little headland, into the next cove. Each one is lovely, and yet I found myself counting down the miles. On the final headland before turning in towards Fishguard, a small gun battery sits on a rocky outcrop where four cannons point to sea. I don’t know when these were installed, but they certainly act as a reminder that Fishguard was the site of the last invasion of Britain. It is one of those things I feel I should have learnt about in school, especially in Wales, but is largely forgotten. I first learnt the story when my own children were little and we were touring in the VW campervan, probably the same year we first visited Aberaeron. Fiona had heard about a tapestry at Fishguard, produced on the 200th anniversary of the invasion, and we went to see it. In 1797 a force of 1,400 French soldiers were landed on the coast near Fishguard. Their intention was to initially take Fishguard itself and then move on to Bristol. In times past the Welsh and the French had taken common cause against the English, so it may be that the French hoped that they might find sympathisers when they landed, but this was not the case, and widespread looting did not help. In the end the somewhat shambolic French army, many drunk on wine looted from Welsh farms (it was evidently still difficult to get good food and wine in France in those days as well as today), surrendered to a force of local militia a fraction of their size. Amongst many small skirmishes with locals, a group of Welsh women led by Jemima Nicholas, a cobbler, and armed only with pitchforks had already captured a dozen Frenchmen. They set out again looking for more, dressed in the traditional dress of a tall black hat and red dress that you still see in picture postcards. The story is that the French mistook them for approaching red coats, hence contributing to the surrender. However, I think it more likely that they were recognised for what they were and the French laid down their arms in fear. No man, whether French, English, or Welsh for that matter, can stand up to a Welsh woman when her anger is raised. This lesson was not forgotten during the Rebecca Riots, one of the earliest examples of grassroots social unrest in Britain (well, Robin Hood excepted). In order to attack the hated Toll Houses, the men dressed as women, it is said to protect their identities, but I think because they were more frightening that way. The tolls were charged on lime, the essential fertiliser on the acid soils of Pembroke, and on cattle being driven to market, a double whammy. They underline that, whether in Wales in the distant past, or more recently in the Arab Spring or London riots, it tends to be economic, not ideological, reasons that bring people to the streets in popular uprisings. These can be uprisings towards greater freedom and democracy, or towards more authoritarian and repressive regimes that promise certainty in times of trouble. The latter is especially important to remember as some of the historically most volatile parts of Europe are mired in the deepest economic recession since the war. The Coast Path goes through the little village of Fishguard Lower Town, once a bustling herring port, then skirts to the headland on which Fishguard is built; I only see Fishguard centre later from the bus. I had decided to go on to Goodwick, the port a mile or so on from Fishguard centre, but if I had decided otherwise, I would have been stuck, as it is not clear when and where to branch off the path to get to the bus stops. Looking at the OS map, I think it’s probably best to follow the main road up the hill out of Lower Town, but, as elsewhere along the path, the signage offers no help. 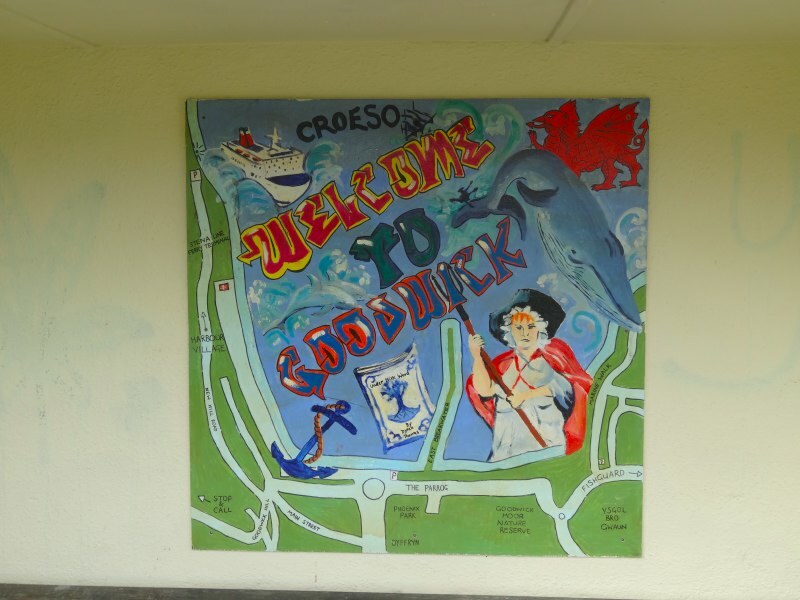 Goodwick is a large port from which ferries go to the Irish Republic, but in its heyday, in the early years of the 20th century, it was a main port for transatlantic ferries, the Mauritania and Lusitania forming a regular service to the USA. However, after the First World War Cunard shifted its main operations to Southampton, leaving only the Ireland run. The last transatlantic sailing to leave from Fishguard was the ill-fated Lusitania a few months before it was sunk by German torpedoes. And so, back on the bus to Newport for the night; I am the only person on the bus and the bus driver tells me things have been very quiet. I ask him if things get busier once the school holidays start. "They used to," he said, "but not in the last couple of years, people can’t afford holidays." Once in Newport, I carry a takeaway from the China Inn back down the hill to the campsite, and get an early night.